State-funded schools are closing the gap on fee-paying schools when it comes to sending students to third-level education. College entry rates are at a historic high with two in three post-primary schools now sending at least 70pc of their pupils to third-level. More than 50 State-funded schools are showing the same 100pc college transfer rate, closely followed by large numbers of others at 90pc and above. Higher education has become the norm for school-leavers across the board, with a considerable narrowing of the progression gap between fee-charging schools and others. The annual Feeder School tables, published with the Irish Independent today, trace the transfer of pupils from about 700 schools to more than 30 universities, institutes of technology and other colleges. College progression rates in the fee-paying sector have been at a peak for a number of years, with about half of the 51 schools showing 100pc of pupils going to higher education, and the remainder, overwhelmingly, as close as makes no difference. 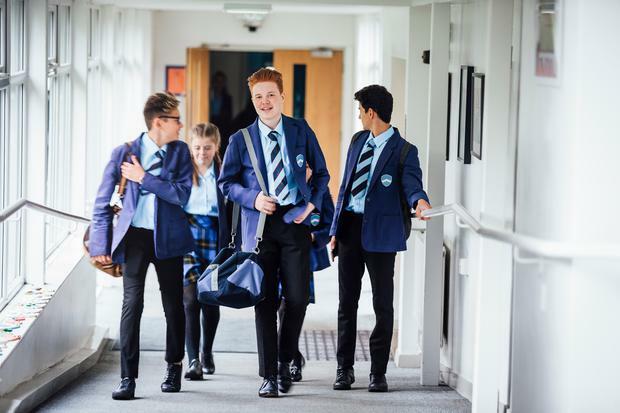 Pupils in fee-charging schools are seen to enjoy advantages, such as a lower pupil-teacher ratio and better facilities, giving them the edge when it comes to garnering the high CAO points that pave the way to college courses of their first choice. But the story of 2018 is the rapid catch-up by about 680 other schools in the Free Education sector. In well over 200 schools, over 80pc of Leaving Certificate candidates are now going on to college, while more than 400 schools have a 70pc transfer rate. Within the State-funded sector, all-Irish schools have a strong tradition of college progression, which is also evident this year. Schools in disadvantaged communities are also among those sending many more students to college than a few years ago, although those in the most marginalised areas lag furthest behind. Breaking the cycle of disadvantage and entering higher education can be a significant challenge for children in these communities, particularly in families where there may be no history of going to college. However, individual schools in the Department of Education's DEIS support scheme for disadvantaged communities are pushing college progression rates to new highs every year. In Dublin's north inner city, 59pc of pupils in Larkin Community College are recorded as going to college in the 2018 tables. Geography, coupled with the preference by Ireland to stick close to home when it comes to attending college, also plays a big role in "who goes where". As in previous years, the tables show how students in south Dublin, which also has a heavy concentration of fee-paying schools, have a particularly strong presence in UCD, while on the northside, DCU is extremely popular. Transport routes to the city centre, from all parts of the capital and beyond, gives Trinity a more even spread. A similar pattern is seen in other cites, with, for instance, UCC holding sway with students in the immediate region. In the same way, the biggest transfers to institutes of technology (ITs) are from schools in the local area, which goes as much for IADT Dún Laoghaire in south Dublin as for those in the regions, such as Galway Mayo IT and Letterkenny IT. The tables can also give an insight into the particular strengths in some schools with, for instance, Loreto, Balbriggan, Co Dublin, continuing to send a large number of its pupils to the National College of Art and Design. With all the universities in and around the cities, it means students in those institutions are doing "honours" degree programmes, including studying for elite professions such as medicine, which are their exclusive preserve, while institutes of technology offer degree programmes at both "honours" and "ordinary" level. The annual tables come in for much criticism from schools, teachers and others for focussing on one measures of a school and its students. Teachers' Union of Ireland (TUI) president Seamus Lahart said the 'Feeder School' lists promoted "a distorted and damaging view that educational success is dependent on students securing places on third-level courses that require high points". Mr Lahart said they also suggested that immediate progress to third-level was the only choice worth valuing. "Thankfully, a school's work has always been more generous and expansive than the tunnel-vision suggested by such a limited mechanism. "These rankings ignore the colossal efforts of those students who have had the odds stacked against them because of, for example, various special educational needs, severe health issues, extremely challenging family situations or their first language not being English," he said. Mr Lahart said school principals were always willing to engage with the parents of prospective students to provide balanced information on the school across a range of contexts.